Here are some resources to help you get the most out of my book Buzzing! 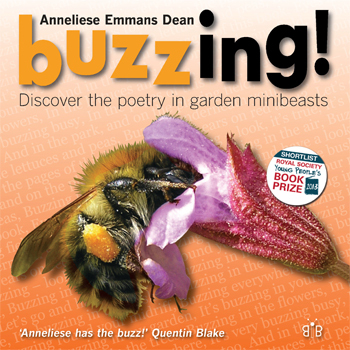 Discover the poetry in garden minibeasts in the classroom. Buzzing! was shortlisted for the Royal Society Young People’s Book Prize, and won the North Somerset Teachers’ Book Award for Poetry. Looking for minibeast poems for your pupils to perform? Then download these Buzzing! Teachers’ Notes. For videos of me performing some of these minibeast poems, click here. Looking for modern versions of famous poems, such as Lewis Carroll’s ‘Jabberwocky’ and William Blake’s ‘The Tyger’? Then download these Buzzing! Teachers’ Notes. Looking for more information about my Buzzing! book, and how to use it as a classroom resource? Then download this Buzzing! Teachers’ Resource. Looking for examples of different poetic forms, including the limerick, double-dactyl and triolet? Then download these Buzzing! Teachers’ Notes. For details of citizen-science recording projects your pupils can get involved in, go to my BugWatch page.